We should all be able to safely cross the street without fear of injury. But as drivers bring more distractions in the car, the number of pedestrian accidents has risen nationwide. In Quincy, pedestrians have been seriously injured and killed in many areas of the city, including along Quincy Shore Drive and Hancock Street in Quincy Center. From 2006 to 2015, Hancock Street was actually one of the top pedestrian crash locations in the state of Massachusetts, according to the the Massachusetts DOT. If you or a loved one has been injured, contact Breakstone, White & Gluck of Boston. Our attorneys have decades of experience representing pedestrians after serious and fatal accidents involving motor vehicles and large trucks. We will thoroughly investigate the accident and help you determine your legal rights. For a free legal consultation, contact our Quincy pedestrian accident lawyers today at 800-379-1244 or 617-723-7676 or use our contact form. $7.1 million: An MBTA bus hit our client in a crosswalk; our firm won at trial and appeal. $1.375 million: Our client was hit by a bus and suffered traumatic brain injury. $1.25 million: Our client was struck in a crosswalk and killed. Read more of our case results. Fatal Pedestrian Accidents in Quincy. Across the city, 23 pedestrians were killed in Quincy between 2003 to mid-2016, according to the Patriot Ledger. The newspaper reported an average of 69 pedestrian injuries each year between 2002 and 2014. Quincy Shore Drive Pedestrian Accidents. There have been several fatal pedestrian accidents along this road, which must be crossed to access Quincy Shore Reservation and Wollaston Beach. In 2015, a 65-year-old Braintree man was hit and killed by a Toyota Corolla, as he attempted to cross the street to get ice cream for his wife. Police said the man had been trying to use a crosswalk and another driver had stopped to let him pass. The driver was charged with motor vehicle homicide, but was found not guilty by a jury after a three-day trial in Quincy Superior Court. Quincy Cab Driver Hits Passenger. In December 2016, a 54-year-old Quincy taxi driver was charged with motor vehicle homicide by negligent operation, a misdemeanor offense, in the death of his passenger, according to the Patriot Ledger. The driver dropped his 68-year-old passenger off at his Quincy Avenue home, accepted his fare and handled the paperwork. Then, without looking, he backed out of the driveway and hit his passenger. Lower Speed Limit. To make city roads safer, the Quincy City Council voted to reduce the default speed limit on certain roads - thickly settled or business districts - from 30 to 25 mph in 2017. This change will benefit Quincy's 92,000 residents and 13 neighborhoods, including Quincy Center, Merrymount, Marina Bay, Wollaston and Germantown. Hard to Cross Four Lane Streets. The Quincy Bicycle and Pedestrian Network Plan notes that Quincy has sidewalks on most roads - at least 79 percent of main roads and 82 percent of local roads. This should be an advantage. Except as anyone who lives or works in Quincy knows, the city's four-lane roads are very wide and hard to cross. Two problem areas are Hancock Street and Quincy Shore Drive. A planning agency recommended a reduction in the traffic lanes on Quincy Shore Drive. This would give pedestrians more room and cyclists will get a new bike lane. In Quincy Center, the city has taken a different approach. It has re-routed traffic and installed new traffic signals in 2016. The new signals are in front of the Presidents Place and near the Church of the Presidents on Hancock Street. Why Should I Contact a Pedestrian Accident Lawyer? Our Quincy pedestrian car crash lawyers have over 100 years combined experience representing pedestrians who have been injured by negligent and reckless drivers. 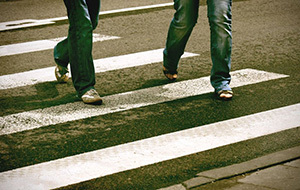 We provide aggressive representation and have a proven track record of successful outcomes in pedestrian accident cases. We are here to answer your questions and assist you with every aspect of your case so you can focus on your recovery. After a pedestrian crash, you may not be able to work for a period of time or may require extended medical treatment. Our law firm can assist you and your family with these and other matters. Learn your rights. For a free legal consultation with one of our attorneys, call 800-379-1244 or 617-723-7676 or you can use our contact form.